This team's ministry is responsible for making sure that members and visitors alike are made to feel welcome from the parking lot to the pew. In doing so, they help pass out church bulletins and special information concerning church events. They also help to direct and assist people to the appropriate bible study class. It is our heart's desire that this team will help us make each person that attends our church feel welcome. This is a group of people that meet every Tuesday at 12:00pm to pray specifically for the needs in our personal lives, church life and for revival in our community, county and country. Following our time of prayer we partake in a fellowship meal at one of our local restaurants. This ministry provides an intimate time where we can seek God's face together. This ministry goes down to Woodland Village every second and fourth Tuesday night at 6:30 p.m. to have a time of worship with the residents. They sing and teach from the Bible, as well as visit with the residents. Our church has a passion for boldly proclaiming the gospel and making disciples of Jesus beginning at our own doorstep. The goal of the Local Missions Team is to reach our community for Christ. We participate in 3 to 4 local mission projects throughout the year and assist in mission needs as they arise in and around our church community. KOZ is a hunting, fishing and adventure ministry led by the men of our church. We welcome boys from ages 8 to 18 to participate. They meet every month on a Saturday from 8 am to 12 pm. The boys are cared for and given a view of Christ and what it means to be a Christian boy/young man in our world today. CLICK HERE FOR MORE INFORMATION. We want to invite children ages 5 to 11 to join us for children's church during the worship hour every Sunday morning. Our mission is to establish a strong Christ-centered foundation through biblical teaching, encourage spiritual growth through the studying of God's Word and equip children to seek Him diligently, serve Him faithfully and share His love with others. Our time is spent worshiping God through song followed with biblical teaching in a fun-filled environment. We have a fellowship meal on Wednesday nights at 5:30 pm. This is a time where we fellowship with one another and it gives our church the opportunity to serve the needs of busy families during the week. Our heart's desire is that this mid-week meal will give you opportunity to connect with other people at our church. 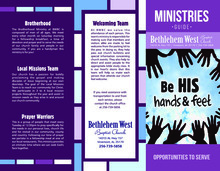 If you are interested in preparing or helping with this ministry, your assistance is needed. The primary purpose and commitment of the BWBC Worship Team, is to serve our home church through blended worship each Sunday. We are made up of a diverse group of believers. However, the real beauty of the choir and musicians happens when we all come together, from all different walks of life, totally blending our voices and talents in worship to lift Jesus up. We love receiving new members into our Music Team Ministry Family. This is a ministry composed of women of all ages who meet every other month on Sunday evening to help meet the needs of other women in our church family utilizing fellowship, devotion and prayer. God's Greenhouse Kids· Growing in Christ, is a children's ministry where God's love is shared and seeds are planted. 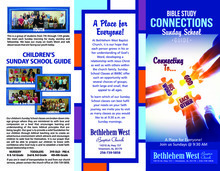 We have classes for ages preschool through 6th grade. Each Wednesday night there is a theme that goes along with that week's lesson and children are encouraged to dress up and have fun! They meet every Wednesday night at 6:30pm. CLICK HERE FOR MORE INFORMATION. We are a group of students from 7th through 12th grade. Our mission is to spread the great gospel message that Jesus saves! To encourage, to love unconditionally, to forgive, to put others before self, to be an example to others and to be disciples for God. Our prayer is that we develop young people into God fearing adults. This is a group of just older youth composed of senior adults. This group enjoys times of fellowship each month centered around visiting different attractions in our area. This is a ministry that helps members of our church who are sick, shut-in, homebound or in a nursing home stay connected with our church family. They also help provide the comfort and attention that these church members need during their time of affliction. Help us comfort others as we have been comforted in our times of distress.